For all holidays, it is within my nature to send a somewhat silly card. I don't always do that for every person on the list, but it's within the realm of possibilities. I'm a Hallmark Gold Crown member, meaning, I carry around their key fob and buy the majority of my cards there. 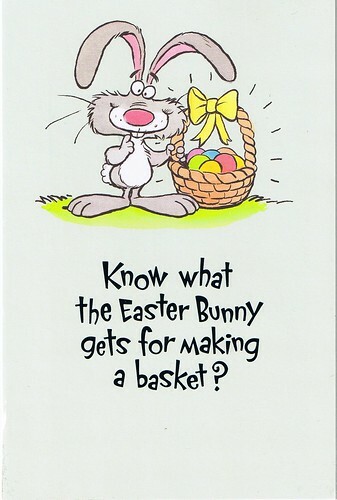 In the last 5 years, as "Merry Christmas" and "Happy Easter" and any other life events moved from actual physical acknowledgement to email messages, I've noticed Hallmark has gone, increasingly, to bits and bats and knicks and knacks; the dustable stuff. Cards make up only half of the store now. For someone like me, who loves to send cards, this has been most distressing. Also, Hallmark has moved away from goofy humor or the sarcasm of Maxine to birds and butterflies and "I feel your pain", cards hoping to tap into the introspective or emotionality of life. There is nothing wrong with this. I have a stash of cards I send to friends which expresses how I feel about their friendship. But when I want to send something silly or laugh-out-loud funny, Hallmark isn't the place to go. It used to be, but it's not now. 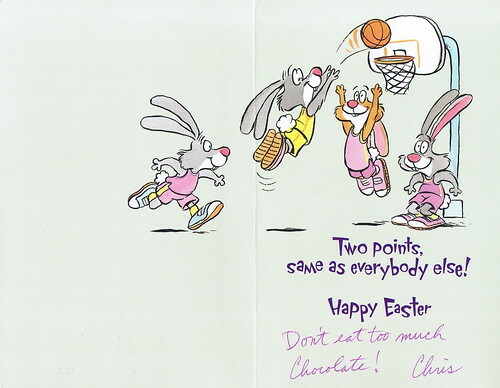 I received the following card from my friend, Chris. Here's the front. I love these kinds of cards. You won't find this at Hallmark. Indeed, this is from an independent card company. Remember when American Greetings had a store in the mall along with Hallmark? If I wanted the sarcastic or off-beat, I went to AG. If I wanted to tell someone how much I appreciated their kindness, I went to Hallmark. Hallmark got themselves in grocery and drug stores and that edged AG right out of the market. Competition is a good thing, usually, and I think, in the greeting card industry, it was good. As email has replaced written word, a part of communication died with it. People don't want to take the time to pick out a card and then address an envelope, affix a stamp and drop it in the mailbox. Sometimes I feel like I and a handful of friends are the only ones who do this kind of thing anymore and, when I walk into a card shop, the store's offerings seem to sort of bear that feeling out. So, if I can find the silly, the goofy and the mildly sarcastic, you know there's a good chance you'll be getting one of those in the future. Thanks, Chris, for the very funny, laugh out loud, card. It's only two points if the bunny was inside the circle.